Thousands of people see our marquee per week. Both east bound and west bound. Billboards are a dime a dozen. 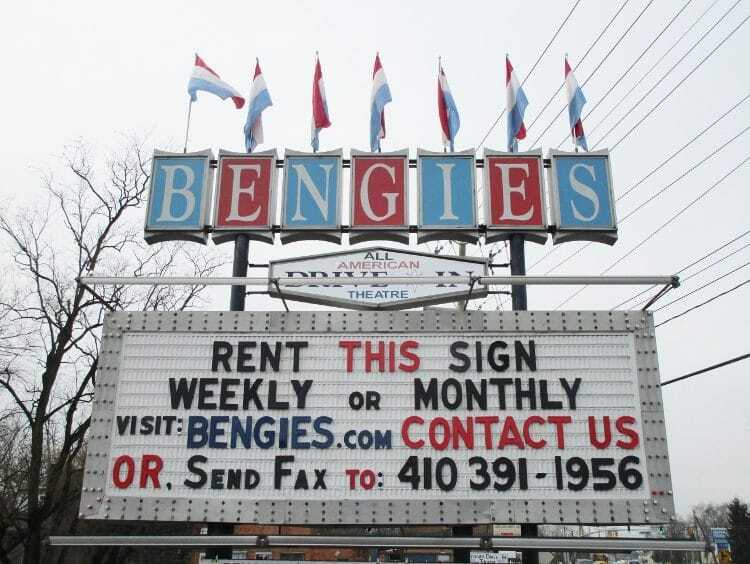 There’s only one place in Maryland you can see a marquee like the Bengies. It has the rubber neck effect on drivers. We have decades of experience crafting messages that fit perfectly, look beautiful, and get your point across. We archive all of our marquee messages. A photo of your ad will indefinitely stay on our website. 1. Rental is based on one side of the marquee, not both, and it is $600 for one calendar month, or $175.00 per week. 1 week is the minimum time a side of the marquee can be rented. 2. The top 2 tracks are always reserved by the Bengies and will not be used for any advertisement. This allows for a message that fits on the 10 remaining tracks. 3. It is possible that within the time-frame you have requested or commenced to advertise, that something of local importance could “pre-empt” the advertisement in whole or in part. If that occurs, the advertiser would be rebated that portion of the time not used for their display. Decisions of what is important is left strictly up to the management of the Bengies. 4. The advertiser cannot specify which side of the marquee is to be used. They may request a certain side, but nothing is guaranteed. 5. Any message used will be agreed upon by the advertiser and the management of the Bengies. Often, the message given to us cannot fit on the marquee. This is “tricky” as most folks do not consider the number of tracks, the size of the letters, and ability to produce an effective display. It is necessary for the advertiser to submit the details, allow us to work with the message into usable copy, and then submit this back to the advertiser for approval﻿.